The Terminator is a 1984 science fiction/action film directed and co-written by James Cameron. It features Arnold Schwarzenegger as The Terminator, Linda Hamilton as Sarah Connor and Michael Biehn as Kyle Reese. The film was followed by three sequels. The franchise has evolved to include video games and a television series. 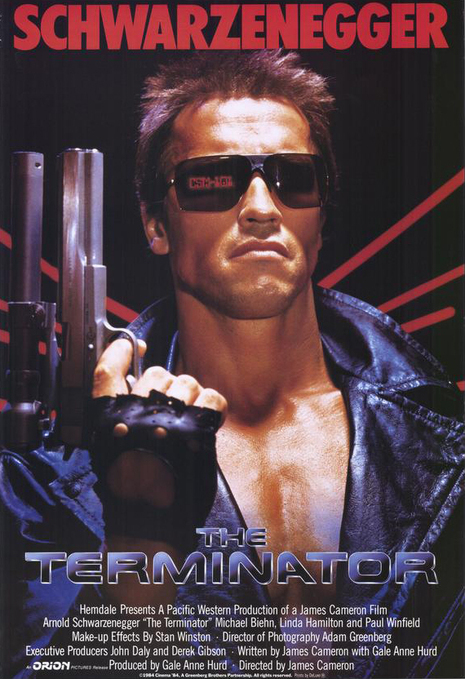 The film takes place in 1984, introducing the concept of a "terminator", specifically the titular character (Arnold Schwarzenegger), a seemingly unstoppable cyborg assassin who has been sent back from the year 2029 by a collective of artificially intelligent computer-controlled machines bent on the extermination of the human race. The Terminator's mission is to kill Sarah Connor (Linda Hamilton) whose future son, John Connor, leads a resistance against the machines. A human, Kyle Reese (Michael Biehn), is also sent back from the future by John Connor himself to protect her. In 2008, The Terminator was selected for preservation in the United States National Film Registry by the Library of Congress as being "culturally, historically, or aesthetically significant".